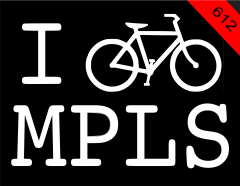 IBIKEMPLS.com - it's where I get all my news: bike lanes confusing? Our own Hurl Everstone thinks the new bike lanes downtown are "going to be a real turn-off." We know one Brompton rider that got clipped last night by a SUV making a right turn off 1st Ave; be careful out there, and get a damn light.